Are you considering purchasing a horse, but don't know where to start? Are you interested in using horse power on your farm, or just want to start a new hobby driving your horse? Are you nervous about riding, but still want to be actively involved by driving horses? Whatever your reason for being interested in horses and driving, we can help! Instructor Danielle Londrigan has worked with horses in some capacity for over 23 years. She has a degree in Farm and Equine Mangement, is a certified Mounted Police and Civilian Sensory Clinic Instructor, has trained wild horses for the BLM, taught riding lessons, trained horses for the Maryland-National Capitol Park Police, and ridden and trained with the Los Angeles County Volunteer Mounted Patrol. She began her driving instruction in 2012, and was easily able to adapt her experience to driving horses for both work and pleasure. She has driven miniature to donkey to standard horse to draft! Red Gate Farm, LLC offers a variety of Horse and Driving Clinics, in private instruction and group format, to help meet your needs. Note: Participants must be 18 years or older, unless noted with the auditor option. If you are interested in having your group participate in clinics or lessons, we are happy to customize a quote for you that will give you the experience you are desiring. Please e-mail or call to discuss. 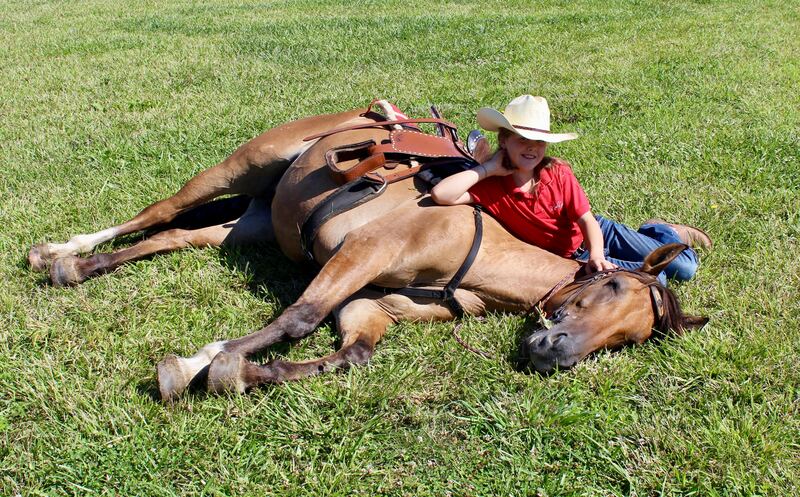 Do you or your child dream of interacting with horses? Do you dream about horses, love the smell of horses, and/or think you might like to have a horse someday? Do you know a special person who begs for a horse of their own, but you think they need a little dose of reality to see what horse-ownership really involves? If you relate to any of the above, this is the option for you! Our unique Horse Experience is customized to your desires. We work one-on-one with you (or your child/loved one) to let you experience a horse first-hand! Options can include cleaning stalls, grooming, learning about tack and equipment, an introduction to horse health and basic care, a lesson on how to search for the right horse for you, perform a few tricks, and so much more! You can even include a short, basic riding lesson (usually 15-20 minutes of actual riding time). Please note, although anyone is welcome to participate in our Horse Experience, due to the smaller size of our lesson horse, riders must weigh less than 200 lbs. for safety of horse and rider. We hope to have a larger horse available in the near future. This clinic is about 6 hours long, with a lunch break in the middle. The morning session is mostly spent indoors, learning "head knowlege" to prepare yourself. After lunch, we will head outside to get hands-on with the horses. You will learn how to safely halter, lead, groom, pick up feet, gain respect and trust, tack up, and actually have a basic 1 hour introductory riding lesson (must be under 200 lbs to ride our current lesson horse, as she is on the small side, though we hope to have a larger horse available in the near future). This clinic is designed to work with you one-on-one, to ensure you leave feeling as comfortable as possible with the basics. As a result, this clinic is scheduled by appointment, and is offered March-November, weather permitting. Friends or Family can participate with you for a discounted price of $100/each additional, but hands-on and riding time, as well as resource materials will be split among participants (you can decide how). Participants must be over age 18, unless a parent/guardian registers as an additional participant or auditor*. Friday morning begins in our dining room, where we will discuss the basics of horse power, preparedness, and safety. We will head outside where you will learn about the harness and its functions. After lunch, you will get hands-on with the horses themselves. You will get to actually harness and ground drive a horse for the first time! Finally, before the day is over, you will get to drive a horse hitched to a forecart! This clinic assumes you already have basic horse care and handling knowledge, and already own, or are intending to purchase, a horse already trained to drive. Clinic must have 3 participants, with a maximum of 6. You will share harnessing and driving time with other participants. ﻿If you have a large group (more than 6 participants) that would like to attend, we can offer discounted rates. Please call for details. Sorry, we do not offer family/friend discounts for this clinic, since it is already significantly discounted. Auditors are welcome for an additional fee*. Click Here for dates, times, and registration information! This clinic is exactly like the Group clinic, but because the instruction is more ﻿ individualized, you benefit from additional harnessing practice and driving time. You will also have more time to sharpen your skills in the obstacle course. This is an excellent option for those who are seriously considering driving horses for work or pleasure, as you will have the ability to be much more practiced and comfortable with the equipment and driving techniques. Friends or family can attend with you for a discounted price of $250/each additional, but hands-on and driving time, as well as resource materials will be split among participants (you can decide how). Participants must be over age 18, unless a parent/guardian registers as well, either as a participant or as an auditor*. This roughly 8-hour, single-day clinic is almost entirely outdoors with the horses, and includes lunch. We will review basic safety and horse handling procedures as needed, move into harnessing, then start honing your driving skills! You will have multiple opportunities to practice harnessing, hitching, maneuvering, backing, and using basic equipment. The work we do will be somewhat dependant on the season and our farm needs, but you will learn plenty to help you prepare to work your farm! Because this is a private clinic, we can tailor to meet your desires....do you want to focus on driving a team, or just a single horse? Would you like to learn how to hitch and drive 3 horses-abreast? Maybe you have no trees on your property, and would prefer to focus on grading, spreading manure, or maneuvering in tight spaces? If you have another option in mind that isn't listed, we are always willing to discuss it if we can make it happen safely! Friends or family can attend with you for a discounted price of $150/ each participant, but hands-on and driving time and resource materials will be split among participants (you can decide how). Note: all participants in this clinic must be over age 18. Younger may audit, but not harness or drive*. Of course, as an Auditor, you should expect to mostly sit and listen/watch during the clinic. You will not recive resource materials, nor will you have any opportunity to get hands-on with equipment or actually drive the horses. You may be invited to ride along in the wagon (applies to the Basic Clinic's "Country Drive" session) IF we have room for Auditors. Otherwise, be aware you may have to hang back for an hour or so and not view that portion of the clinic. Therefore this option is best for those who are curious, but not committed to horses yet, or if you have a friend, spouse, or minor who is registering for a clinic. The fee is for the day, there is plenty learn by watching and listening, and you are free to come and go as desired, though we do ask that you be courteous and try to avoid distracting the other participants by doing so. Also, you are wecome to join us for lunch! Have you attended one of our clinics and just want more experience? Perhaps you've been driving your own horse back home, but would like to improve your skills? Did you used to drive horses, and just miss the feel of the lines in your hands? This option is for you! Similar to riding lessons, this time is used to simply improve your skills and give you additional practice with basic driving skills. Depending on your goals, we will work with you on single or team, challenge you with obstacles, work on traffic safety skills, and much more! You will drive one of our 3 main vehicles for these lessons, depending on the goal for the day. This option is not intended to hitch to or learn about farm implements or using horses for work. It's sole focus is to improve your comfort level and give you time to practice basics. Please note, at this time, we only offer lessons using Red Gate Farm, LLC horses and equipment. Your lesson time will include harnessing and unharnessing the horses, so we offer the basic package as a 2-hour lesson. This ensures that you get well over an hour of actual drive time. Additional driving time can be purchased at a rate of $50/hour to extend any single lesson. As a general rule, you will have an instructor riding with you the majority of time. No charge for auditors of these lessons, and auditors are welcome to ride along on the vehicles (if seats are available), however, they may not drive.